This article was originally conceived some long time ago but was set aside for various reasons. These reasons included my own indisposition, the demise of the ‘Antique Tackle Observer’- which at the time I thought would be short-lived. Alas, like so many other events in all our lives the period of hibernation of the magazine has proved to be somewhat longer than predicted, however, the re-emergence of the ‘Antique Tackle Observer’ online is welcomed. This article shows all the different ‘checks’ fitted to the 3” wide drum Perfect throughout its period of production of some 50 years. 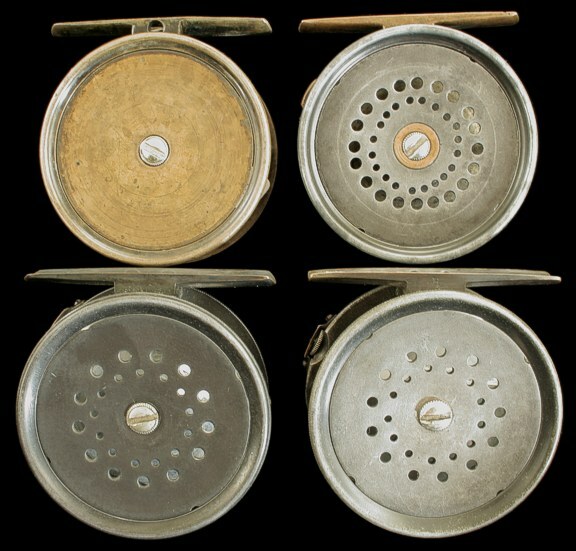 The 3″ inch Perfect was first listed by Hardy’s in 1891 and continued to appear in the catalogues until the outbreak of World War two in 1939, though it was amongst the reels suspended from production due to the first World War. The precise period of suspension is not known as notification of this decision did not appear until the 1917 catalogue was issued. As no catalogue was issued for 1916 it is possible that the reference to suspension would have appeared then – with the decision having been actioned in 1915. Given the lack of demand for this reel we believe that no reels containing the 1917 check were ever produced in the 3” size – though we would like to hear to the contrary. The first reel of the nine in this size which comprise the subject of this article is the all brass 3” wide drum Perfect with solid drum. 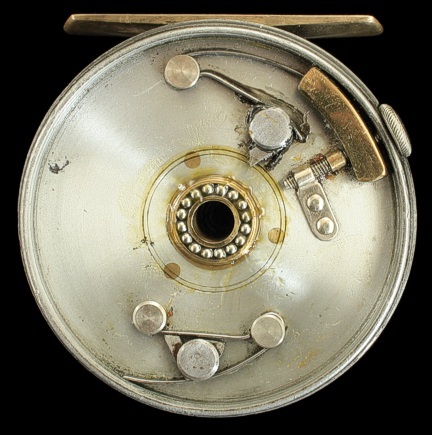 This reel has the early version of the check with the ratchet Pawl secured in position by an ‘S’ spring. Pressure was applied to the pawl through a ‘C’ spring under control of a rim mounted regulator screw which controlled the presser slide movement. This method of rim mounted regulator control remained standard throughout the Perfect range excepting only some rare ‘Silent Check’ models, ie those fitted with a constant pressure non – adjustable spring plate which applied drag to the inner rear face of the line drum. The 3” all brass Perfect is an extremely rare reel and should be acquired if seen. 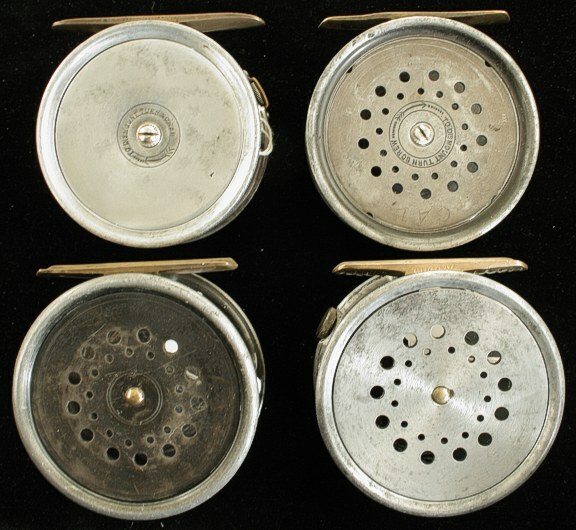 The second reel pictured is a 3” Brass faced reel. Note, the ‘S’ the spring securing the pawl has been deleted. This principle of applying drag remained in use for several years with only slight changes to the thickness of the flat ‘C’ spring, presumably to extend the life of the spring – and to reduce the possibility of failure. All Alloy reel with heavier "C" spring. Around 1905 the design of the ‘C’ spring was revised from a flat spring to one with the side arms standing at right angles to the frame face. Again, it is likely that this change added strength to the spring and allowed for greater pressure to be applied to the pawl to increase the drag. This re-designed ‘C’ spring complete with modified presser slide is shown in reel number 4. Reel number 5 introduced the all new check first referred to in the 1911 Catalogue – but not pictured until the 1912 catalogue. Reference to the new check was made in the 1911 catalogue in the text describing the newly introduced 3.3/4” St. George reel. Commonly referred to as the 1912 check- it was probably being manufactured during the latter part of 1910. This check work rapidly became a favourite amongst anglers, and its desirability both to fishermen and collectors persists to this day. It is seen here in a left hand wind Perfect fitted with a solid face plate to the drum. In this configuration it is an extremely rare reel. 1912 check with rare uncatalogued version of presser bar. 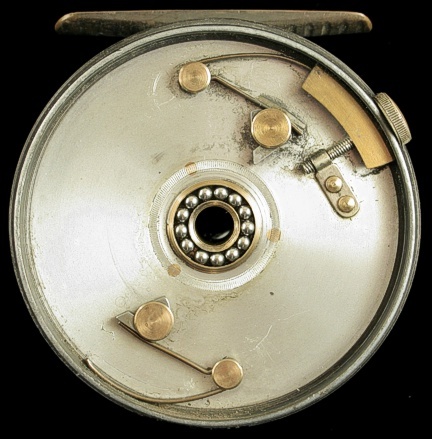 This reel is possibly unique having check work comprising components from the 1912 check and what is perhaps the prototype presser bar for the 1917 check work. Here we have to consider the circumstances which existed at the time. The country was engaged in a war the end of which was not in sight. We know that certain components and materials were either in short supply or simply not available – ball races are but one example. Other action taken to combat the predictable shortages generated by the conflict – of materials and certain alloys – included the suspension from manufacture of certain reels from the company’s product line referred to above. This in turn encouraged the search for economies and the 1912 check which had been some five years in production was an obvious candidate for revision. The arrangement and design of components developed further into what we now call the 1917 check. (See Reel 10 below). By this means Hardy’s had not only managed to keep to their policy of introducing modifications roughly every five years – but had designed and produced a check which was not just functional – but also satisfied the need for economy of material and was cheaper to manufacture and assemble. 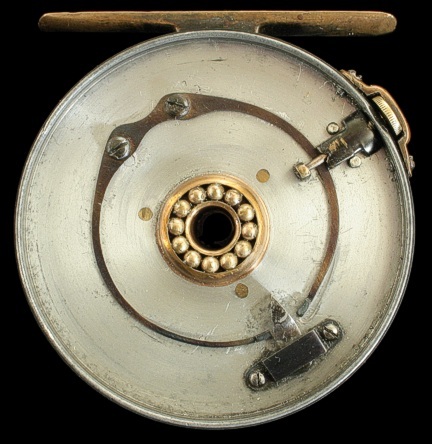 It is possible the reel shown here was a prototype which either ‘escaped’ from the factory or was sold rather than being dismantled after its construction. Reel number 7 shows the jump from the 1912 check through the check of reel number 6 to the new 1921 check fitted to the wide drum Perfect. This 1921 check was eventually to be improved for 1922 by the inclusion internally – on the same inner face – of a spare spring and pawl. 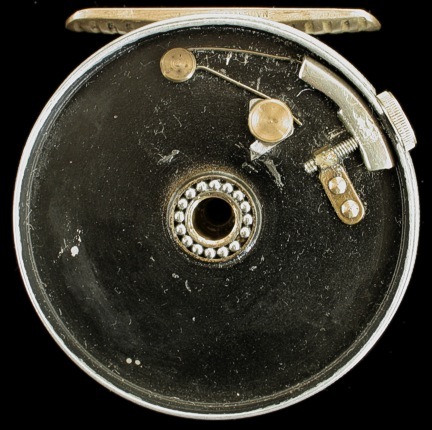 The purpose of this was to ensure that in the event of a spring or pawl failure – or loss – the angler could continue fishing by simply fitting the spare components. Reel 7 1921/1922 check works with spares. Reel 8 shows the final version of the 1922 check work with the spares repositioned for engagement with the toothed wheel if – or when required. This revision occurred during 1928 but was not pictured in the catalogue until 1929. Picture 9. The reader will now look quickly at this reel and think 1917 check. 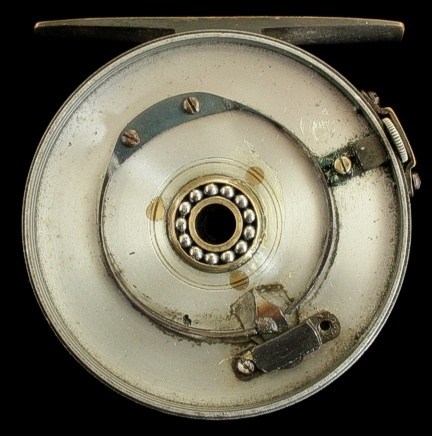 While it is similar to the 1917 check fitted in the narrow drum Perfect from that date – this Reel actually dates from around the middle 1940s. This can be determined by the black paint applied to the reel components. Most of the black paint has been removed – or worn off the drum face and the handle plate – but remains intact on its other surfaces. 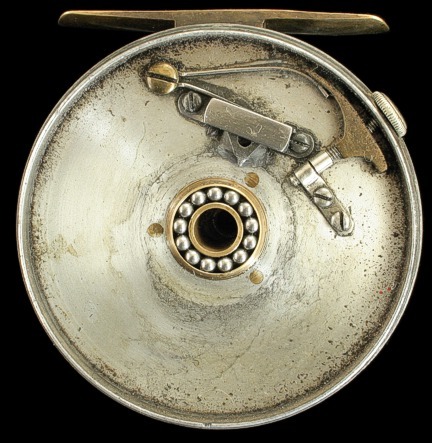 The missing ‘spare’ components would allow for another reel to be made – albeit also without spares. 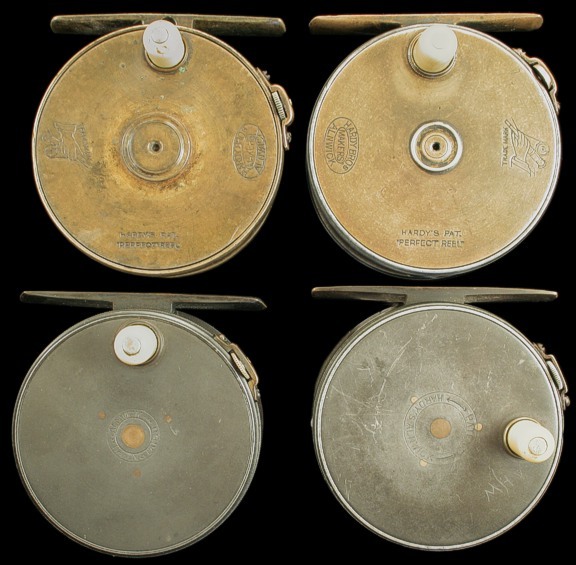 Reel 9 shows the 3” wide drum issued during the war years with single check and no spares. 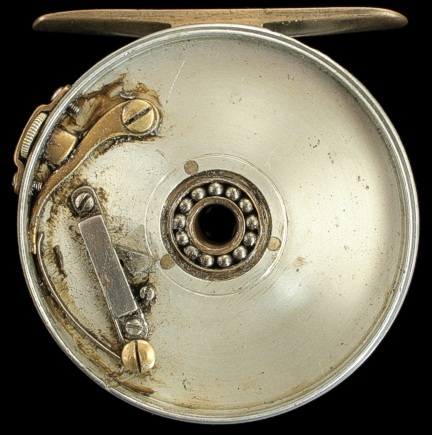 This was the final version of the reel issued during wartime of the 3” wide drum reel – it was not re-issued following the end of hostilities. Final version of the 3 inch Wide Drum Perfect. This foregoing is not the extent of the information concerning these reels. We need now to consider other factors which may have gone unnoticed by the casual reader or indeed the casual collector which have a significant impact upon the scarcity – and hence the value – of the 3”Perfect. Let us consider first the period during which the reel was introduced. It is common knowledge that game fishing was largely the preserve of the wealthy and very few ordinary people could afford to participate in the sport. It would be another sixty or seventy years and two world wars later before it became the mass pursuit that it is today, demand for expensive fishing reels during this long period remained relatively low. So what does this mean for the 3” Perfect? A study of the production figures for this size reel shows that between 1925 and 1937 some 214 reels were sold. We need at this point to remember that there were other suppliers of quality fishing tackle in business in this country. Several of these would no doubt have wealthy clients who for one reason or another preferred reels made by them, all of which reduced the potential for sales of Hardy’s products. Other factors which would also have impacted upon demand for reels in general were – the depressions of 1921 and 1926, and the 1929 economic crash in the United States. This was accompanied by an increase in import duty to 29% for fishing tackle imported into the States. Taking all these factors into account and studying the known production figures available for the period, it is unlikely that total numbers of the 3”wide drum Perfect exceeded more than 300 Reels. This entry was posted in Hardy 3 inch Wide Drum Perfect. Bookmark the permalink. 7 Responses to Hardy 3 inch Wide Drum Perfect. Excellent article, Ted. Have you considered the possibility that the 1912-check (reel #5) is in fact RHW, but with the tensioner located in the position one would expect for a LHW? I submit this for consideration based on the direction of the spring, which engages the pawl as we one might expect for a RHW reel. By way of example, I offer reel #6, which we assume is RHW since no mention of directionality is given, and because to my knowledge the wind direction of Hardy reels using a spring and pawl check mechanism are generally opposite of the “point” of the spring, e.g. if the spring looks like would indicate LHW. 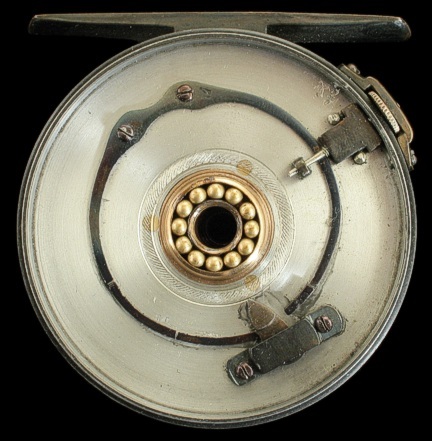 Reel #6 shows the same pawl and spring arrangement as reel #5, the only difference being the mechanism by which pressure is applied to the top of the spring; however, the application of pressure is roughly the same. Hence, my position that reel #5 is in fact RHW. Of course, the only true test might be an empirical one, so I’m curious what winding bias reel #5 displays? Finally, it has been shown that manual alteration of the spring can effect winding direction opposite of the original factory setting. So, if in fact reel #5 demonstrates a bias for LHW, is there evidence in your expert opinion that the spring has been modified in some way? Finally, would you consider adding photos showing (a) views of the reels from the side, i.e. through the spool so that the pillars can be seen and (b) the bottom of the feet showing the method of attachment to the cage? I trust an education on my idle speculation is shortly forthcoming and I await your answer with anticipation. Best regards, Ted, best regards. Thanks for the comment. You will note that I said early in the text that this article was begun some long time ago and was set aside incomplete. Only now have I been able to return to it to provide something new for the visitors to this site to read – hopefully to keep the ‘Antique Tackle Observer’ ticking over until such time as the editor can find the time to resurrect it as a publication. For that to happen we all need to keep the magazine alive by submitting new material from time to time. It is worth reminding the readers that the opportunity to write articles on any angling topic still remains and submissions would be welcomed by the editor. I have continued to do my bit toward that – but there are many more knowledgable people out there who could also write on matters of interest about which I know nothing and it is to be hoped some will respond to this suggestion. I am currently away from home and I need to return there in order to address your queries. I do return to base in about a fortnights’ time to go straight into hospital for further surgery so it may be a little while before I can answer the points you have raised. All I can do at this stage is promise to respond as soon as I am able. I can confirm that the bias on the check is for LHW, and I do understand why you should question it. Generally you would expect the checkwork to be in the ‘mirrow image’ position – but I think this bias is created by the shape of the pawl which is probably not an equilateral triangle. It is true that having satisfied myself at the time that the bias was correct I did not bother to dismantle the check chiefly because when I fiddle with small items like springs and things – they seem to fly off never to be found again. The other point is the regulator is in the correct position for finger tip control, as these answers are from memory I prefer to await the time when I can respond with certainty before relying further on what I can remember. My apologies for not being able to provide more information at this time Chris – but as I’ve said above – I’ll get around to it when I can. Best wishes for s successful and speedy recovery, Ted. I hope I can speak for the entire collecting community and beyond in saying that our thoughts are with you and we are all pulling for you. Be well! 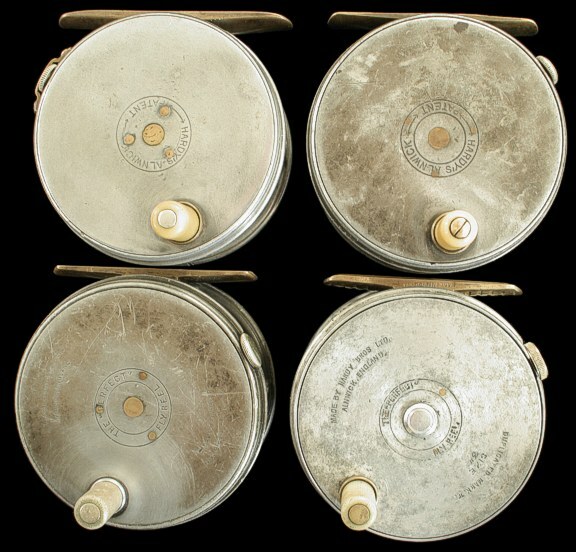 The 3″ wide drum reel seems to have generated debate concerning its parentage and appearance – I am not responsible for either. I merely submitted it for possible inclusion in the rest of the article – and made no claim other than it is a rare reel in this configuration, I’m pleased to note that view found support. As far as re-leading is concerned I view it as simply “The outward show of vanity” if a fishing reel can be accused of such a gesture. Some re-leading I have seen is an improvement while other attempts have made that which is already bad – worse. But this consideration detracts from the point of the article which is – why did Hardy’s never offer the line guide for the 3″ wide drum? Leaving aside those periods (wartime and their aftermath) when the reel was not made – it has been in the catalogue for around 100 years. Find the answer to this question and we will all be a bit smarter. The most likely area for investigation is the quality of the alloy from which the reel has been made over the years. Everyone knows the tensile strength of the alloy has vastly improved and it may now be the case that the current material – together with improved machining techniques have made possible the fiitting of the guide to the 3”wide drum Perfect reel. I note the comment from ‘Greenwell’. I’m sure he knows that as the diameter of the reel decreases the arc it makes becomes shorter. It therefore becomes necessary sink the line guide deeper in order to seat the guide on the outer flanges. This may account for the apparent removal of excess material in that area. If this is so then different tooling might well solve the problem. 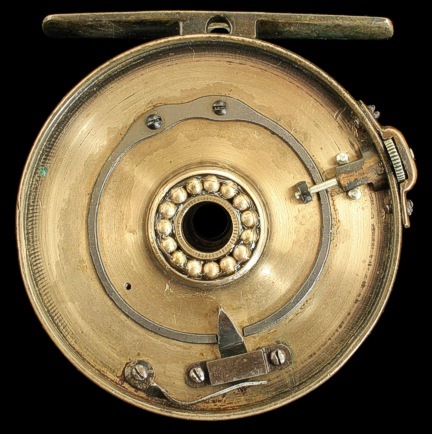 History shows that from around 1904 until 1930 a line guide was only offered on reels sized 3.1/2″ upwards. 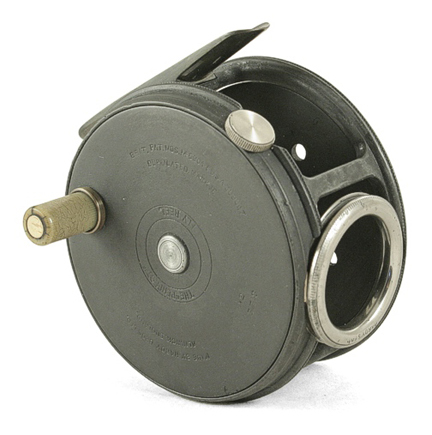 This changed in 1930 when the line guide was first offered on reels sized 3.1/4″ upwards. One fault collectors find irritating when researching Hardy products is the seemingly endless use of photographs depicting components long since dispensed with, this line guide is one such example. We know this guide was pictured first on the St. George Salmon reel in the 1921 Catalogue, but it was obviously in use many years before then. Some 30 years more had to pass before a different image showed what is probably meant to be this wide drum guide fitted to a Perfect. To conclude, the reel I showed was bought precisely because of the line guide, and demonstrates that It has been possible to accommodate such a guide on the 3” reel for some long time. I always hope what I write may be of interest to someone – to those who already know more than I do about this subject – my apologies. The question remains however – why didn’t Hardy’s use it? The only answer would seem to be the long history of minimal demand from anglers for this particular size of reel. Ted, I am in possession of a 3″ Wide drum identical the 1912 check with rare uncatalogued version of presser bar version. I’ve looked hard at your picture and believe it is not the same reel. Shoot me and email and we can discuss. i have been collecting hardy for some years now and agree with all you have written. i have many reels including ari harts reels that i have a soft spot for but my favorite reels by far are the early perfects and the 3 inch is the best reel for me. i have a few 3inch and the bfp is my favourite . i am looking at a 3 inch perfect on ebay at present but unsure of its identity as it has brass pillars! the winding plate is defiantly hardy no doubt but the foot only has 2 rivets i presume holding it on and they are filled in from the bottom so cant see them. i would be able to tell if it were a full hardy if the person could open the reel so i could see the check but they cant. have you any idea if hardy made uncatalogued reels with brass pillars ? I often wonder why there are so many Hardy hater,s out there when most of them have never touch a Hardy Rod or reel.There are a lot of good reel manufacturer,s out there and a lot of them in the U.S..Here,s a story for you,I was fishing Atlantic Salmon on the famous Margaree River on Cape Breton Island anyway one morning I had got back from the river for lunch and there was a guy from either New Hampshire or Vermont,he was in a major meltdown because his Orvis Spey reel had a major malfunction but it just so happened that I had a Hardy Marquis Salmon # 2 with me that was for sale,I was only asking what I paid for it but he was acting like I had a hole in my head and refused to even touch the reel let a lone try it,I even told him to try for the evening fish and let me know what he thought of it but that was also a no go.Well the only thing I could think of was that this fellow was super pro American made which is fine,I guess.Meanwhile I did eventually sell the reel for $225 Canadian dollars which is a steal. I,ve also noted that on the fishing blog,s and forum,s the Hardy gear get,s crapped on a lot. I,ve been using Hardy reels for over 42 year,s and these reel,s have never let me down,I fished with 3 Hardy Reels for year,s and after the turn of the century I started to pick up more Hardy,s that I,ve never used,I now own 15 Hardy,s and most are Pre 75 and some were made in the 20,s and 30,s.As far as I,m concerned they are the best reels in the world especially the older model.My favorite,s are my 8/9 Gold Sovereign and on my Spey and switch rod,s my 4 inch Perfect and 3 3/4 Perfect and for trout fishing my 3 1/8 Perfect on a 5 WT. and my Hardy Flyweight on 3WT.Nothing sounds as good as Hardy when a good fish is on the line.